Column #289 Dr. Darts, Trina Gulliver, and the “Brit and Yankee” Podcast! Dr. Darts, Trina Gulliver, and the “Brit and Yankee” Podcast! 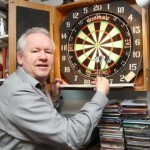 Good old boy Doctor of Darts, Patrick Chaplin, is at it again! He has just today announced the pending publication of the first-ever book featuring a female darts player – seven-time world champion Trina Gulliver. Called “The Golden Girl – The Autobiography of the World’s Greatest Ladies’ Darts Player,” the book will certainly be popular among darts enthusiasts everywhere, and not just for the photographs. Also, on Easter Monday (yes, Monday, April 9) Chaplin will be the subject of a podcast on an AMERICAN-based website – the Brit and Yankee – run by ex-pat Phil Clark, now living in Chicago. The podcast will air in three parts with second and third bits following “at fortnightly intervals,” whatever that means. Check out the Brit and Yankee virtual bar website at http://www.thebritandyankee.com for details. Rumors that this later development foretells Chaplin’s plan to switch his citizenship are premature although I do remain hopeful. I am pleased to announce that I have joined forces with seven-time Women’s World Darts Champion, Trina Gulliver to produce a unique record of Trina’s incredibly successful darts career. It has been great piecing together Trina’s story. We met several times during late 2005 and recorded over twelve hours of interviews. Since then it’s been a case of writing up and clarifying issues with Trina. Nothing – absolutely nothing – has gone into the book that Trina has not been happy with. She’s a great subject and I’m sure the book will appeal not only to dart players and darts enthusiasts but also to anyone interested in sports biographies. Indeed, Trina’s book will be unique. It will be the first-ever book published with a woman darts player as its subject. 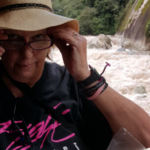 For that reason alone, the book must create a great deal of interest.” However, Trina’s book won’t be the first one written by the lady darts player. Way back in 1978, an American darts enthusiast named Madeline Dolowich produced a paperback guide to the game way back in 1978 called The Dart Book but that was not autobiographical. Although Madeline was not a professional dart player, she did have some strong views on ‘women and darts’ as, of course, does Trina. Trina will reveal in her book how she has achieved her amazing success in a sport where the men’s game far outstrips the women’s in terms of press attention, sponsorship and TV exposure and reveal much about the tension and frustrations felt within the women’s game for proper recognition and reward. The book is all about Trina succeeding in a man’s world against incredible odds. I am proud to be associated with this important project and to play a part in reconstructing Trina’s fascinating, and sometimes disturbing, life story. Undefeated in seven world championships, Trina’s autobiography, ‘“The Golden Girl” – The Autobiography of the World’s Greatest Ladies’ Darts Player’ is to be published by John Blake Publishing of London, although the exact date of publication has yet to be confirmed. 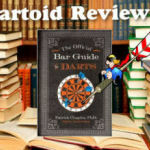 Further information will be featured on Chaplin’s website at http://www.patrickchaplin.com, Gulliver’s website at www.trinagulliver.net, and in forthcoming issues of Darts World and in Gulliver’s Darts World column, ‘Gulliver’s Travels’.